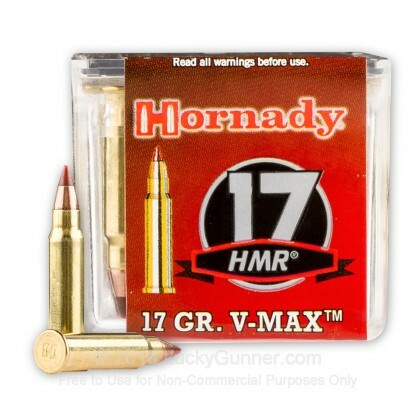 Look no further than Hornady's 17 HMR round that uses top of the line Hornady V-MAX bullets. These bullets are manufactured by Hornady which is renowned for a philosophy of "Ten bullets through one hole". V-MAX bullets feature a premium polymer tip and streamlined design that yields ultra flat trajectories and tack-driving accuracy at long-range. It also creates dramatic expansion on impact with a muzzle velocity of 2,550 ft/sec. Each round is brass-cased, rimfire-primed, and non-corrosive. I put 100 rounds through my new Henry Varmit Express no problems. I will continue to use it. It was a great experience to be able to get the ammo I needed at such a great price. Shipping was fast and service was great! Good ammo. It runs my A17 Savage semiautomatic And Henry lever gun . I use nothing but this ammo in my Savage bolt action bull barrel with a BSA Sweet 17 scope. I've been reading lately that these rounds don't have much stopping power. Maybe it's their aim. I nick named my rifle "Painless" because it's always been a "one shot one kill" varmint round for me. These rounds literally cause a groundhog to blow it's guts at 100 yards or less. I've dispatched at least 50. About 20 big fat raccoon's as well drop with one round. I got a Coyote at just over 100 yrds on a quick 3 second aim and fire. It jumped over backwards and ran off. I found it the next day with a hit just rear of it's rib cage. It ran about 20 yrds before dropping. It had a 2" wound cavity. I can put 5 rounds inside a dime at 100 yards. Even with a cross wind. 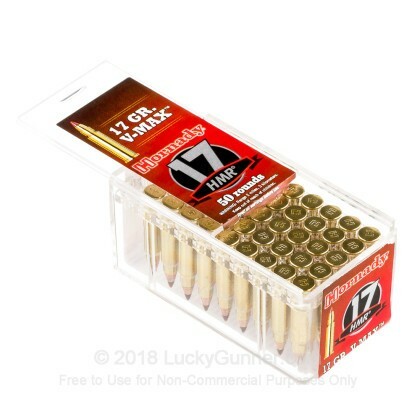 I LOVE my .17..
All of the ammo I have bought from Lucky Gunner has been great. I have not had any problems and I have bought a lot of ammo. The .17 gr V-Max from Hornady are great and best if used in the Henry Rifes. Great ammo, never a mis fire from a great supplier. Lucky Gunner has my business! Thanks! This is the first time I have purchased this ammo. I thought it would be higher quality than the CCI it was not. There are obvious manufacturing defects in the casing. Where the pieces are put together it is bulging around the outside of the case. Out of 20 rounds shot now have had five misfires. I will save myself the few dollars next time and go with the cheaper ammo. The product was just as discriped and was delivered very quickly. The price was very reasonable,your shipping and my rec. was great service .it wont be the last time u hear from me. Have already shot several coyotes with these rounds, and have done some target shooting also. Very pleased with them! Thanks for your prompt service also! Liked the ammo quality and the follow up after the sale! From one East Tennesean to another... I'll be back!!! Thanks and keep up the good work!!! The best HMR17 ammo ever!!!! This ammo is the best for my Ruger. I shoot 3 times a week and I was running out of it.We have shoots every week and I never miss one. We shoot Golf Balls dangling on a string at 50 yards, I have yet to miss one. We also shoot Rim Fire at 100 yards, my worst target is a 98 with 6X. I even outshoot the Semiautos. I am a 80 year old retired Marine and I still got it. Keep smiling and keep on shooting! ALWAYS GREAT SERVICE FROM LUCCKY GUNNER!! The .17 HMR is a devastating round.They hit with authority! I have used Hornady, CCI, and Federal. And I keep coming back to the Hornady. They all will stop a squirrel in its tracks. I shot 8 groundhogs last summer with these wicked hornady rounds. At first I was worried I had missed and it was tryin to act like a possum because I didnt see any blood whatsoever. But after closer inspection of the carcass I realized the bullet did hit the groundhog squarely where I aimed for the chest at just a little over 100 yds. And being curious because of so little blood I decided to open it up and have a look at what the bullet did inside. And It was amazing the force that bullet put on the vitals, the heart and lungs were damn near unrecognizable. I am impressed with these rounds in that they seem to hit harder than some of the others that are made. And looking at squirrels as I am butchering them it is noticeble, and I have to use head shots with this ammo otherwise it will punch a little hole on entry and blow half the ribcage and part of the shoulder out on the other side. And as my buddy found out never use one of these on a squirrel running up a tree to a hole. He shot straight up the rear end of a squirrel and boogered up all the meat from one end to the other. I made him clean and eat that one.... I am very happy with this product and carry this little rifle all over the place with this ammo. the 17 hmr is ultimate badass! 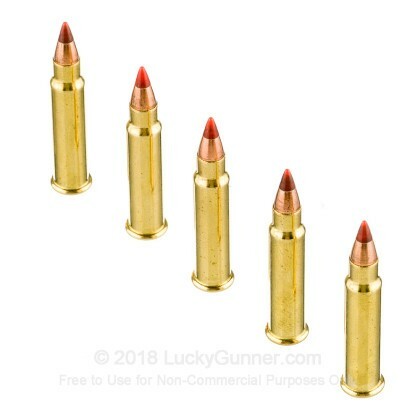 I have fired about 500 rounds of the 17 HMR V-max through my rifle and found that these rounds can hold dime size groups at a hundred yards with my rifle. I have not had a misfire or jam and the rounds burn clean. The only problem with them is as I have been told about the 17 cal. round is that if the wind picks up the groups can get larger then a dime.. Shot 200 rounds. All true, no glitches. Used this caliber with the Hornaday 17 gr V-Max last year in the annual Surprise Valley, CA annual squirrel roundup. their own for next months 20th annual "squirrel round up." The impact and destructive capability of these rounds far exveed what one would expect from a pellet size projectile. Fired at a one gallon milk jug full of water resulted in the jug being split from top to bottom and water being thrown approximately 10 feet to the side and straight up. Shot at an opposum that was trying to tear into our rabbit pens, it was an instant kill and the impact point showed the flesh removed from the bone on the entire upper front leg where it passed through an a nichol size hole where it entered the chest cavity and exploded the heart. The opposum never knew what hit him. It was an instant kill. Fired at 200 yds with a scope, the HMR round showed no drop in it's trajectory and a consistant grouping within 2 inches. This is a good deal and a very good product. I was totally unfarmiliar with the .17 cal. except in a pellet rifle until I ordered these rounds for my Grandson! When my grandson came to me and asked if I would order him some .17 HMR ammo for his new rifle his Dad had bought him, my first question was "You're what?" I had never seem the .17 cal. HMR and honestly thought it was a stretch to go that small with a rifle, except for a pellet gun. Boy was I in for a surprise! 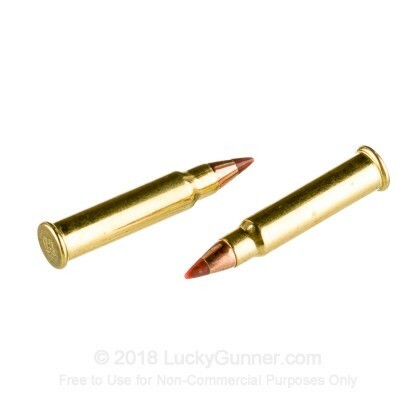 I ordered both the HMR hollow point small game rounds and also the Hornady .17 HMR Varmint Express. To tell the truth, I ordered the latter ammo because I thought they looked "cool" and my grandson would like them (and also because the specs on the rounds were impressive!). 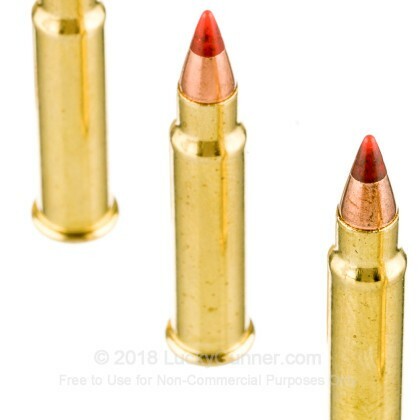 My grandson zeroed his rifle in, using the hollow point small game rounds, because they were "normal" rounds and were a little less expensive that the HMR Varmint Express rounds with the polymer tips. But once he had set his scope up for 100 yds, with very good grouping (1 1/2 inch spread, I might ad) we both wanted to see what the Varmint Express rounds would do, and what difference the Polymar tips would make on impact? We had some milk jugs filled with water, set up at 100 yds, that we fired on with the regular hollow point HMR's to see what kind of damage they would do? That had been pretty impressive, so we so we wanted to see what difference the Hornady .17 HMR Varmint Express with the Polymer tips would make in comparison? It was amazing to me (and my grandson) the difference the Varmint Express made! The standard hollow point HMR rounds that we had been using made a small hole in the front of the jugs and a larger hole as they exited backs. He fired the Hornady Varmint Express, with the polymer tips, at three different milk jug targets. Each bullet made a small entry hole in the 1" bull's eyes we had drawn on the milk jugs. But the bullets did not exit the jug targets! Instead, on impact, the bullets split each milk jug from top to bottom on the target side,completely fragmenting the bullets into about 7 to 9 pieces, that were left inside the jugs! The impact force was so great, that the tops of the jugs shot about 20 feet into the air, and water gushed from the tops and split fronts of the jug targets with great force! We neither one expected that kind of result! He, nor I, can wait until some unfortunate varmint trys to raid my chicken house again so he can see what actual stopping power his new rifle has with this new kind of ammo? Wow! 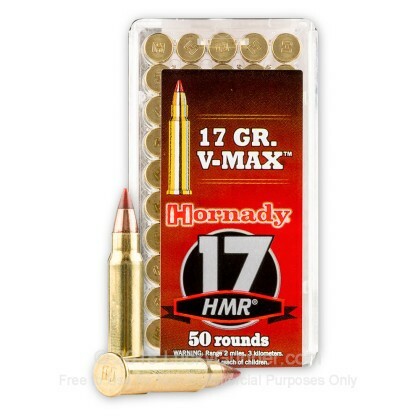 We also have this 17 HMR - 17 Grain V-MAX - Hornady - 500 Rounds ammo in stock in a bigger quantity.